The "Buy One Get One" Offer for Jio Prime users - How is it beneficial? 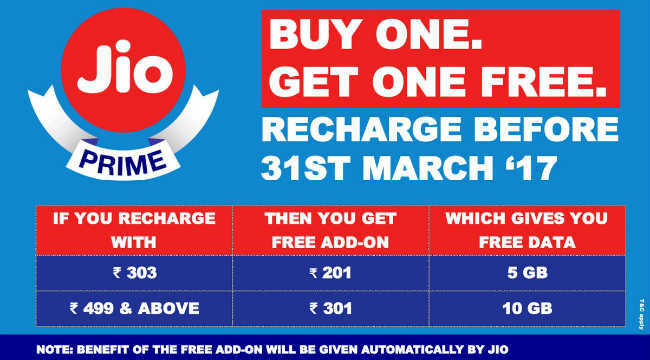 The “Buy One Get One” Offer for Jio Prime users – How is it beneficial? Very much to the customer’s relief, almost every other major telecom operator including Airtel, Idea Cellular, and Vodafone also tried to come back with similar attractive offers. 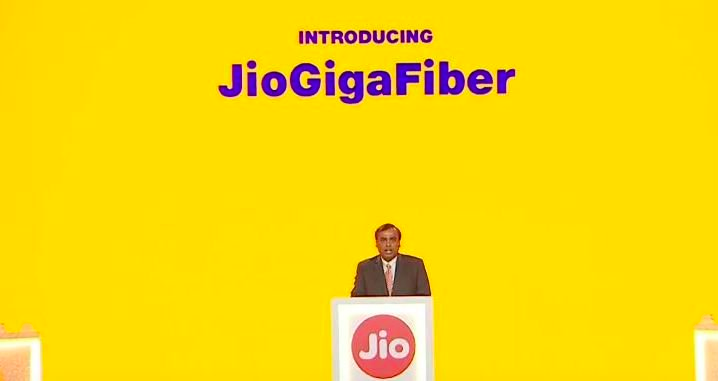 However, Jio was again quick in reacting and hit back with a Buy one Get one offer to sweeten the deal further. So under this new Buy one Get one deal, Jio has gone another step ahead and is giving extra free data to all the prime subscribers who go for either the ₹303 or ₹499 plan. Under this offer all the prime subscribers who have chosen the ₹303 plan get another 5GB bonus data and the subscribers who chose the ₹499 plan get a bonus 10GB data, it is to be noted that this is over and above the regular 1GB per day or 2GB per day respectively that already comes with the above plans. 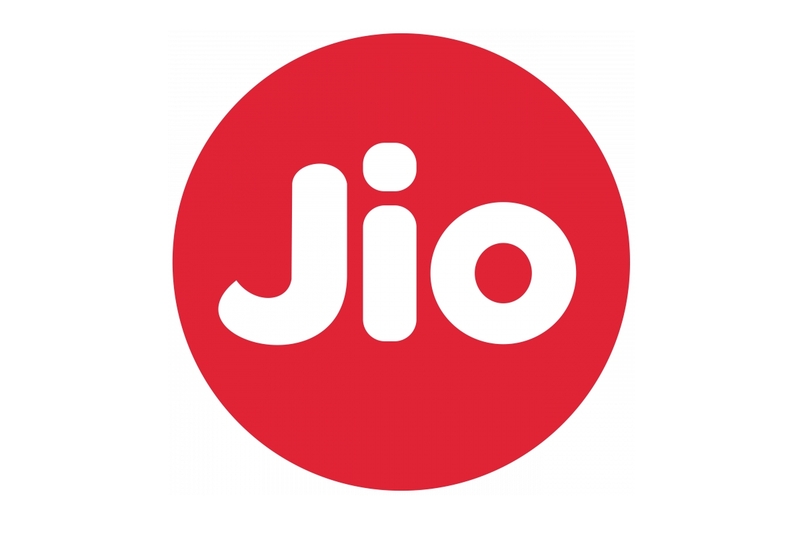 Although Jio on the first day of March claimed that their servers crashed due to the fact that they were unable to handle all the load that came from Prime subscriptions, it doesn’t really seem true because there are several who are not interested in enrolling under the prime membership scheme, this could be one of the several reasons why Jio chose to give this bonus data to the subscribers. According to a recent private survey in areas around Delhi, it was noted that the subscriber retention rate of Jio was much lower than expected, in fact, it is speculated that just about 30-40% of the customers who took a sim from a particular shop have come back for a recharge of the prime membership. 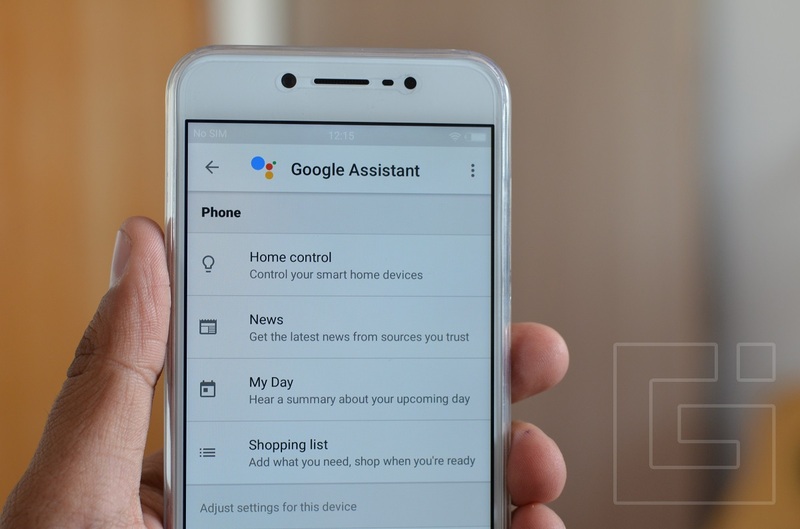 However, it could also be that many of the customers who purchased a sim in a store could have recharged online for the prime membership. 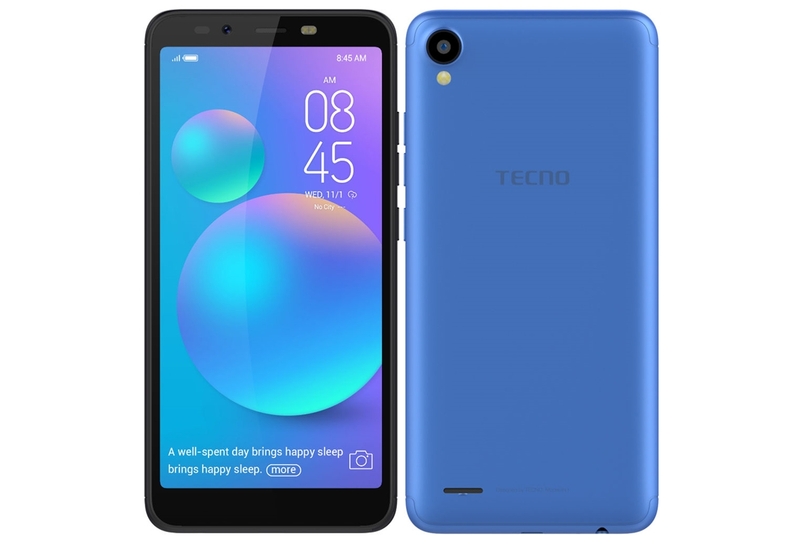 It should also be noted that the three major telecom operators have left no chance and have introduced similar or better plans to retain their customer base. Airtel has introduced a plan which costs between ₹345 and ₹349 based on the circle that the customer belongs to, this gives 1GB data access for 28 days, and Idea Cellular has the same offering for ₹346. Vodafone went a step ahead and launched ₹345/₹352 which would give 56 days of data at a threshold of 1GB per day if recharged before 15th of March. However, no matter how lucrative the offers are from Airtel, Idea, and Vodafone, there’s still a catch. For example, out of the 1GB data per day that Airtel is giving, only 500MB of it can be used at any time, the rest 500MB is for night(5a.m-2a.m), very similar to this is the catch from Idea cellular which limits 500MB data for the data, and the rest can be used only between 12 a.m and 6 a.m. Fortunately, Vodafone doesn’t have any such restrictions on the data capping. Also, unlike Jio which is giving truly unlimited calls to all the networks and 100 free SMS per day, none of the three telecom operators that we’ve talked about above seem to offer any free SMS and they’ve also capped the daily call limit to just 300 minutes and over that is a weekly limit of 1200 minutes. Existing premium customers are very unlikely to shift to Jio unless they find a valid reason to do so. Either the quality that they’re currently experiencing with their current network providers should be below optimal, or the quality being offered by Jio should be much above the current market standards. If not for all this, at least the rates being offered by Jio should be much lesser than the competitors to lure the customers into their service. It is unlikely that Jio has introduced the free additional data only to offer an advantage over what it’s competitors have to offer., Jio has always targeted the Data users more, and it is more of a data aggregator as all the calls and SMS are anyway routed over LTE using VoLTE standard. Jio also doesn’t want to charge you for excessive usage of data beyond the one GB per day limit. However, they’ve chosen to cap the speeds after the first 1GB of the day to 128kbps. The more likely reason why Jio could have added this bonus data is that they want to encourage the consumers into using more data, Jio also has several additional data pack options which they like to call as boosters. Using these boosters which cost anything between ₹11 and ₹301 you can buy up to 10GB data extra. Unlike Jio, all the other three major competitors seem to be charging much more post the daily data threshold. For example, without any additional subscription plans both Idea Cellular and Vodafone charge about ₹4000 per GB and Airtel charges ₹8000 per GB. It clearly explains the current market scenario. 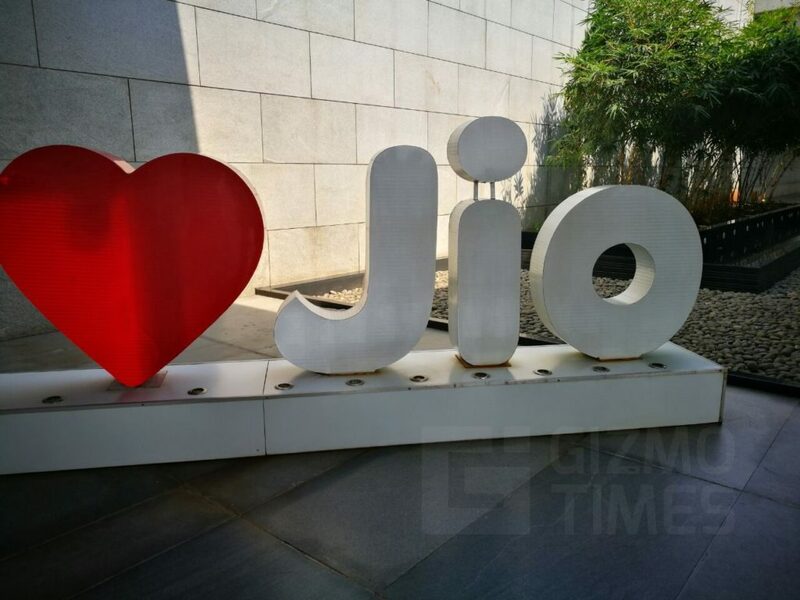 Although Jio is providing such good plans, analysts claim that Jio will lose a huge share of its customers when they start charging for their service. What’s your opinion on this? Will you continue with Jio or are you going back to your primary operator? I’ve subscribed for Jio Prime Membership by paying Rs. 99. Do I have to recharge with Rs. 303 now? What if I don’t want to use the data or anything but just keeping the Prime Membership active? Need your clarification on this. Yes, according to what they said. But again, who knows, you can skip a recharge and only then you will know. I am going to do an experiment with one of the SIM cards and see if it works that way. Will update here later.